42 year old on Cape Cod. $40 for a table. Mel only had a few left when I got mine. If he is full I'd split mine with you. I mostly have Lures and some conventional combos. I wont need too much room. Just a heads up, this Sarurday in Wareham there is a new and used tackle and gear event. Capt Mel True set it up. I grabbed a table and Im going to try to thin out some of the stuff I dont use anymore. Dont know much more about the event other than it's a $5 door fee to get in. If you're iin the area might be some good deals to be had. I'm thinking it's a "Fishing Flea Market" thats indoors. I was in the Raymarine booth Saturday and Sunday. Very busy Saturday, Sunday less so. It was great seeing everyone that stopped in to say hello. It's always nice to chat in person with all of you. 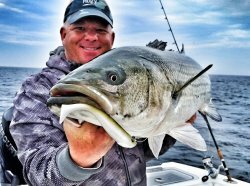 Will this mild winter mean a strong early striper bite, if so how early? I didn't fish that area, but had reports from NB, Marion and Mattapoisett of jumpers. So you should be able to hunt them in your area as well. 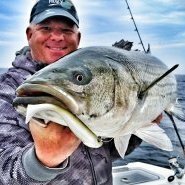 With the OTW show just airing and a lot of free time not fishing this winter, several of us have been discussing the Kingfish "fishery". I was just told that at RISSA during the MA SW Derby awards a young man won the Kingfish category with a 9.14# king. Breaking the former MA Record that Chris Megan from OTW had tied earlier this summer. (Congrats to BOTH of them) So not only were there good numbers around, but also larger ones than in past years. So I got to thinking. I know that Kingfish have visited the Cape in the past. Back in 2003 we had a great run of Kings and Spanish in Buzzards Bay. I know that over the years guys would get them on the shoals off the south side while trolling but never huge numbers. I have a theory and feel free to comment on it, refute it or add to it. Two seasons ago, the Kayak guys off the south side landed a fair number of Kings. They managed to keep it fairly quiet as most were focused on Albies during that time. The way most of them were hooking up was trolling swimming plugs as they transitioned to and from the albie grounds. This "STYLE" of fishing is something that in the past was not really done. I mean how many people in boats were trolling swimmers in shallow water during albie season? I would say not many. Yak fishing is increasing in popularity and has really taken off in the last few years in particular. So, have the Kingfish ALWAYS been there in varying numbers year to year and we just MISSED them? Kings do show themselves by airing out, but its random and you kind of have to be looking for it. The number of fish subsurface is exponentially higher than whats showing. So t hey would be easy to drive past or just overlook. Think about it. If you were tossing metal or soft rubber at albies and got cut off 5 years ago your first thought would NOT be KINGFISH. It would most certainly be BLUEFISH. Kind of like wahoo south of MV, tuna guys don't run wire so wahoo catches are somewhat rare. But when targeted, guys can and do land solid size and numbers. So my questions are: Did the Yak guys stumble upon a formerly missed fishery ? Were 2017 and 2018 just blips on the radar like 2003? Did the recent high number of Pnut Bunker contribute to the great seasons? As that seemed to be a key in finding them. Can these fish be live baited on light wire rigs like down south with tiny blues or small pogies and bump trolling or kites in areas that would seem an "Unusual" way to fish during that time frame. Imagine kiting Hedge Fence? Or ANYPLACE inshore within a few hundred yards of the beach in August Just my mind throwing out random thoughts. Please chime in, I'm really curious about this. That was us. The fat lifeguard girl was a mess. We were 105 yards off the beach. (I checked with GPS) She wouldn't stop her foolish hollering about "100 yards" Alls well that ends well. Thanks for the heads up ! I got a look at the show ahead of time. Should be a good one and provide solid info on how-to local kingfish. I've got plenty of room with that wide timeline. The new boat is going to be AMAZING. A little more information would be helpful especially regarding species.